Hi! My name is Beth. I am London's leading specialist in the Solomon Yogalates Method and feel super passionate about this dynamic blend of Hatha Yoga and mat-work Pilates as a winning combination for long term health and mobility. I love helping clients overcome postural imbalances, pain and injury, providing them with the tools to access space and freedom in body, mind and breath. The award-winning and therapeutics-based Yogalates exercise programme is safe, enjoyable and suitable for all ages and fitness levels. As well as group classes and regular events, I also offer private tuition packages for those who would benefit from a more personal experience. I originally trained as an actress, so much of my twenties were spent overcoming rejection, chasing auditions and living out of a bag whilst touring abroad. My anxiety-prone 'Type A' personality found it difficult to cope, and eventually this lifestyle took its toll on my nerves and wellbeing. During my teenage years stress manifested itself in a number of physical symptoms, such as chronic eczema or sickness during high pressured exam season. I was given beta-blockers at age 16 and remember thinking, 'is this really a long term solution?'. Short answer...no. It wasn't long before my passion for Yoga and Pilates started to blossom and I discovered Louise Solomon's award-winning method whilst touring as an actress in 2010. My physique completely changed as a result of practising Yogalates a few times a week. I became strong, tall, toned, fit and flexible with improved balance and coordination. For a naturally clumsy person who never went to the gym this new found passion was a surprise to everyone around me, not least myself! I also discovered a deep sense of connection between body, mind and breath that I had never accessed before, grounding me firmly in the present. Daily meditation and breathing exercises (known as 'pranayama' in yoga) have become invaluable tools for enabling me to better cope with stress and anxiety in the long-term, and I adore teaching these practices just as much as physical yoga postures ('asanas'). Prospective clients often tell me they regularly practise Pilates but would love to find greater flexibility in their 'stiff' bodies, or peace of mind to help them cope with daily stress. Similarly I meet others who in the past have suffered an injury in a public Yoga class, often due to a lack of awareness of their own postural misalignments and/or limited core stability. My belief is that both Yoga and Pilates support you in different and complementary ways. As your teacher, I hand pick the best, and most importantly, safest elements of traditional Yoga and Pilates to create a dynamic fusion of East and West. 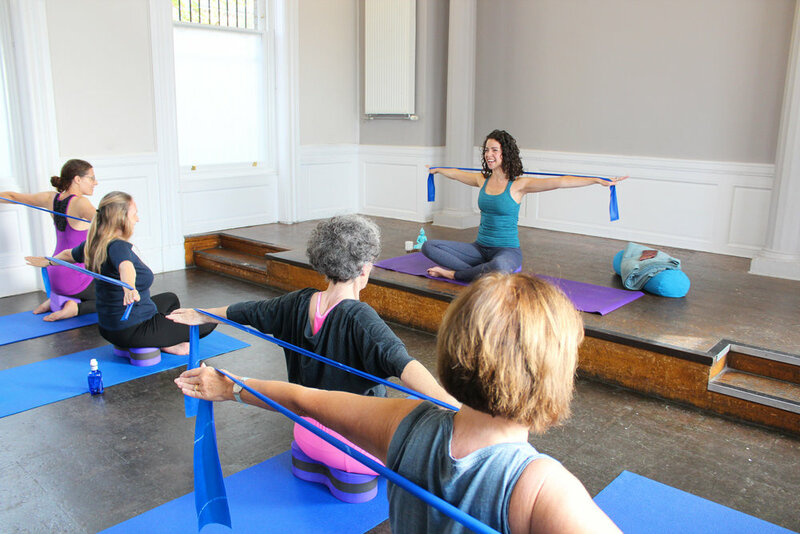 In class, we combine the postural and core strengthening work of Pilates with the physical, mental and spiritual practices of Yoga to bring balance in body and mind. I've helped countless people (many beginners) to overcome pain and injury by combining various therapeutics-based body conditioning exercises with deep relaxation techniques to improve their posture, core stability and musculo-skeletal balance, equipping them with a strong, supportive and functional foundation for daily movement. It's a lot of fun too! Yogalates is an award winning and internationally acclaimed exercise system that was established by fitness and wellbeing pioneer Louise Solomon in the early 1990's. It combines core-stabilising, posture-enhancing mat work Pilates with regenerative ancient Yogic practices; encouraging strength, stamina, tone and flexibility. As a holistic approach to health and fitness, Yogalates uses the breath as the central focus; bringing balance and unity to body, mind and spirit. This constantly evolving method incorporates the latest scientific research into functional movement, back care and therapeutic exercise. 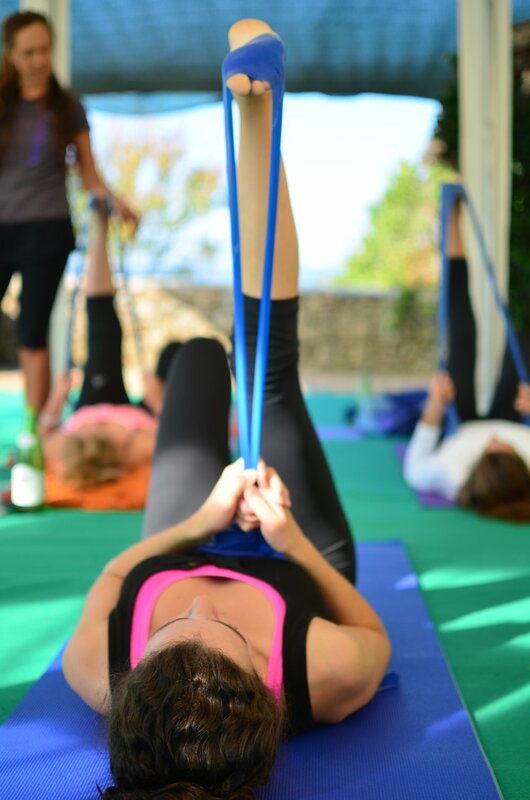 As well as the use of yoga props such as bricks, belts and bolsters, Yogalates often incorporates resistance bands (used in physiotherapy) and hand weights to replicate the resistance training of the Pilates machines and further enhance strength, stamina and balance. Yogic breathing techniques are an integral part of the method; calming the mind, soothing the nervous system and detoxifying the body. Sessions always conclude with guided relaxation in one of several restorative yoga postures.